From a lifelong Francophile, this revelation feels quite shocking: Tokyo is better than Paris. Here’s why. Without question, Tokyo is one of the world's greatest food cities. Chefs are among the many trusted resources who extoll its unequaled sushi and other historic culinary charms. You’ve heard of the high-tech toilets, the robots and the hyperspeed trains. But most Americans with passports visit Paris before making it to Japan, if they ever do. As a lifelong Francophile, I understand why. I love most everything French, from single-flavor éclairs (unlike the chocolate-glazed, custard-filled torpedoes here, their frosting matches the drapes) to Alain Ducasse (I wrote his New York guide book). I’ve lived in Paris, dated Parisians, used any excuse I could find to go back, and became a writer on the off chance that the flexible career could find me back in Paris one day with a sunny Montmartre flat and innocuous smoking habit (a wonderfully cliché fantasy, if there ever was one). So after spending 12 days in Japan, this revelation feels quite shocking: Tokyo is better than Paris. Here’s why. 1. The Pastries. In Shinjuku’s Isetan department store alone, the basement pastry counters read like a Who’s Who of French desserts, including macaron–master Pierre Hermé, éclair whiz Sadaharu Aoki, chocolatier Jean-Paul Hévin and Brittany–based caramel maker Henri Le Roux. Japan is home to satellites of the world’s best sugar artisans. You might just stumble across an outlet of the famed La Pâtisserie des Rêves while sightseeing in Kyoto, or spot faux Cronuts (“New York Rings”) while grabbing a cup of coffee near Shibuya. Japanese confections are brilliant, too. Just know that when in doubt, it’s filled with red bean. 2. The Coffee. Do not be confused: Paris is known for its cafés, not the coffee served in them. Earlier this year, Slate ran an essay titled “Why Is Coffee in France So Bad?” with glimmers of hope for the future. New York, my current home, is a hub for expert roasters and brewers, but I had the best coffee experiences of my life in Tokyo. For vintage atmosphere, try sipping Colombian coffee aged since 1954 and roasted on-site at the pour-over-only Café de L’Ambre. 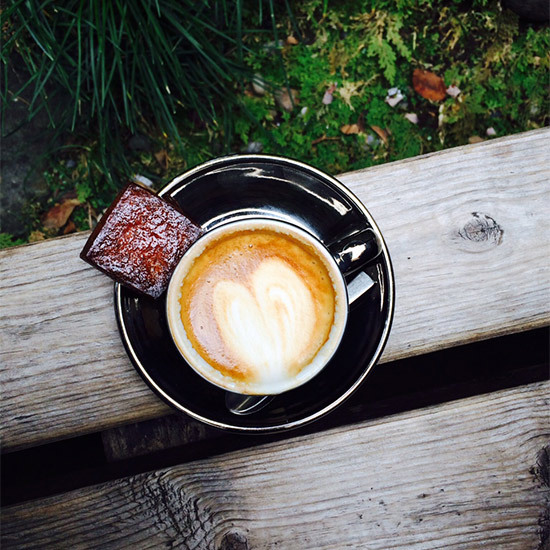 For espresso drinks, wander through residential streets to Omotesando Koffee, where a sole barista stretches milk to an exceptionally silky creaminess, and the extra-custardy take on canelés are baked into a square shape (photo). Both places also served perfect iced coffee; L’Ambre uses coffee ice cubes and condensed milk, while Omotesando makes a mean shakerato. 3. The Trains. Oh, God, the trains. The 3.5 to 4.5 hour Amtrak between New York and Boston would take about two hours (and be on time to the minute) if American trains were up to speed. Europe has its own share of high-speed railways but the Tokyo subway is fairly brilliant. Using Google Maps, you can easily pinpoint which lines and stops to take anywhere, and at that point it’s fairly stress-free. No one pushes to get in before riders exit (looking at you, NYC) and lots of in-service elevators and escalators make traveling with luggage a nonissue, whether you’re going to the airport or bulleting over to Osaka. 4. The Cheap Eats. Long stereotyped as a super-expensive city, Tokyo contradicts its reputation with a vast array of edible and drinkable values. Fantastic ramen for two + draft beers + homemade gyoza? $30. Filling omelets on a stick (tamago-yaki) at stands around Tsukiji Market? $1 (look for the fresh-made ones; they’re hot and creamy). In Paris, you won’t find a brioche for that price. 5. The World’s Best Restaurant. As if Tokyo didn’t have enough elite chefs and Michelin-starred restaurants, it’s about to get a two-month Noma pop-up. The world’s most famous chef, René Redzepi, is setting up shop in Tokyo early next year. Details to come in June. 6. The Trip. Thirteen hours direct from NYC is nearly double the length of a flight to Paris, but it’s not so bad! If you leave in the afternoon, you get in toward the early evening, generating zero guilt that you should spend the whole day exploring. Dinner, shower, bed please. Also, the JAL flights we took were some of the quietist, least-stressful flights I’ve had in a long time, setting up this final reason. 7. The Japanese. It’s true that there is very little English spoken in Tokyo, but it’s enough to get around because people are so nice. Pause to look at a map? Someone will stop and try to help (usually amusingly unsuccessfully). A Kyoto cabdriver called a bank for me to figure out why my ATM card wasn’t working, discovered that convenience stores like 7-Eleven accept foreign cards, tracked one down, waited for me, and rushed us back to a Buddhist temple for our longstanding appointment before they locked the gates. No English was exchanged. (Note that the cash was for the temple, not the driver.) Of course, kindness and widespread adherence to etiquette makes the service industry exceptional, but it works both ways and customers seem equally mindful of respect. The word that kept coming to mind was “reverence.” A sushi chef focuses on his art, while the diner appreciates it. A single blooming cherry blossom tree becomes an event, with teenage girls and grizzled businessmen alike stopping to admire and photograph it. It’s an amazing place…and I’ll definitely be using any excuse to go back.